What are the most common causes of an activation problem? If you experience a problem while activating an exam, you can try the following solutions to resolve it. Please submit a support ticket if you are having activation problems and provide as much information as you can so that we can assist you quickly. Verify that you have entered your user name and password correctly. Passwords are case-sensitive, so you should ensure that Caps Lock is not enabled when you enter your user name and password. Verify that you have entered the Activation Key correctly and that you are using the correct key for the correct product. You can copy and paste your Activation Key from the purchase receipt you received or by accessing your account on the Boson website and selecting the Purchase History tab. Activation Keys are version and product specific. Therefore, you will only be able to use the key to activate one product. For example, a key for the Boson ExSim-Max for CCNA 640-802 practice exam will not activate a Cisco Press for CCNA ExSim practice exam, because they are created by different vendors. Try temporarily disabling your User Account Control (UAC), firewall, and anti-virus applications. Occasionally, security software can cause an activation or installation problem. If the Boson Exam Environment (BEE) is still not able to access our activation server, you may need to consult your IT administrator and verify that your computer is not accessing the Internet via a proxy server. If your computer is running Windows 7 or Windows Vista, you might need to run the software as an administrator. You can accomplish this by right-clicking the icon you are using to launch the software and selecting Run as Administrator. If your computer is not able to access the Internet, you will not be able to activate an exam that is delivered through the BEE. Can I order ExSim or ExSim-Max products on CD? Our practice exams and product demos are only available via download using the Boson Exam Environment (BEE) from our website. To install a practice exam or demo, you must first download and install the BEE. Once the BEE is installed, you can activate any practice exams you have purchased or select and download any available demo from the Get Demos tab from within the BEE. Error Message: "File Permission Error: We were not able to automatically correct the problem." How do I submit a bug or request a feature? If at any time you experience a problem with the application or you would like to request a feature, please report it using the built-in bug/feedback reporting tool. Select Bug Report/Feature Request from the Feedback menu, and click Next. You will be asked a few interactive questions that will enable us to direct your feedback to the correct department. The first question is whether or not your feedback is about the exam content. Click Yes if you wish to submit feedback about a question or an explanation, click Next, type in your comments, and click Submit. You should click No if you are having a problem with the software or wish to make a feature request. If you selected No,you will be prompted to choose whether you want to submit a feature request or to let us know about a problem with the application. After you have made your choice; click Next,type in your comments, and click Submit. When you submit bugs, a more detailed summary will better help us pinpoint the actual problem. Please let us know if you find any problems with the exam content. Examples of exam content related issues may include missing answers, incorrect answers or explanations, or an inability to select more than one answer when multiple answers are correct. Why are some files, images, or exhibits missing from my exam? Files occasionally become corrupt during the download process. To restore missing files, images, or exhibits, please update the software. To update the software, you should do the following: First, select the exam that is missing images or exhibits from the My Exams tab and then click the Exam Tools button. From this menu, click Update current exam to begin the update. Please allow the update to complete; you will see a message or pop-up box stating that your exam is now up to date. This should resolve any issue you have with the files, images, or exhibits. Windows Font files can become corrupt. 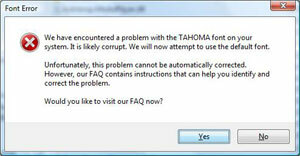 When this happens, an error could occur when our software attempts to use the corrupted font file. It is usually a style within the font that is affected (bold, italics, or regular). Replace the corrupt Font on your computer with one from another computer that is running the same Operating System. Windows fonts are located in the C:\Windows\Fonts\ directory. An alternative solution: Navigate to the C:\Windows\Fonts\ directory. Locate the corrupt Font file. Copy the font file to another directory. Right-click on the copied file and from the pop-up menu, and select Install. Repeat with all copied font files. If this solution does not work, please refer to Solution 1.